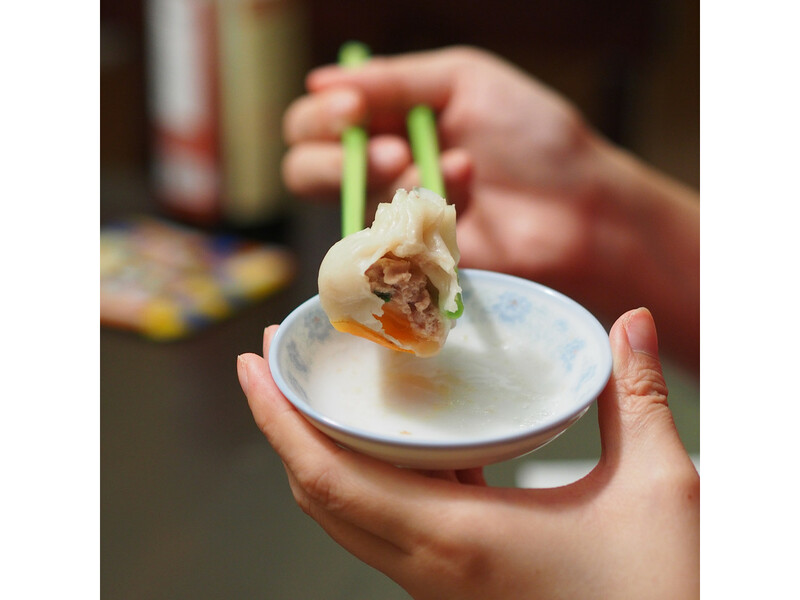 Well, after we came back from Shanghai, China, we were really missing some delicious Xiao Long Bao so we decided to be adventurous and make some! First of all, make a soup with fatty meat so it solidifies. I boiled some pork feet with pork belly in water until it reduced to about half. When I claimed it was done, I seasoned it up as though I was about to drink it – with a little heavier hand of seasoning! Now, we have to let the soup set and become “jello” so I add a package of flavourless gelatin just to make sure it sets. Put it in the fridge at least 3 hours before using it! The next thing I did was to marinate the meat. I wanted the meat to be full of flavour so I did that before making the dough. Basically here, mix everything together and let it marinate in the fridge! If your soup has set at this point, pull back the layer of fat/oil and break down the soup jelly and mix it into the meat marinated. If you put this in at this point, make sure you keep the meat in the fridge so your soup doesn’t become “soup”. Now, as everything is chilling and developing their flavours, we can make the dough! Making the dough is actually super easy! Basically you measure out the flour and pour the boiling water in. Mix until the dough is smooth and keep mixing as we’re trying to develop the gluten! When it’s soft and smooth, add the cold water in and knead for a few more minutes! It will have a nice texture and bounce back when you poke it – then it’s ready. When you reach this point, let it rest in the bowl covered for at least 30 minutes. Then, I get to fill the xiao long bao wrappers and place them on a cabbage lining to my bamboo steamer! I tried to make as many pleats as possible as that’s how it’s prettiest. Now, we prepare the steamer and we’ll steam for about 15 minutes! Now it’s done! Be careful, it’s hot and the soup you can see at the bottom of the dumpling — this means it’s really hot!! Enjoy! So, yes, the ingredient line up seems long but it’s all good, as it’s just typical ingredients any Asian would have in their pantry! First, wash the cabbage and peel the onion, ginger and garlic. I cut my cabbage into little pieces, and I grate the onion garlic and ginger. I put all these ingredients into a bowl. From there, we can add the ground pork into the mixture, and mix a little bit. Now, we can season it. It sounds funny, but you can add whatever you want and how much of it as you want. I don’t cook using measuring things, so it’s all “rough estimates”. Add whatever seasonings you like, add it as flavourful as you like, it’s yours and make it yours! So, from here, just add all the goodies and mix well. Oh yeah, you don’t like pork, don’t use pork! 🙂 I like it on the fattier side so it’s “juicier”! I let my meat sit in the fridge for about an hour just to marinate the flavours a bit. If you like the meat firmer, crack an egg into it – kind of like a meat loaf filling. I like to leave mine alone. Now some time has elapsed, we can start making the dumpling skins! It’s super simple and I do remember learning this from my grandma. But, I did have to cheat a little and verify with “Google” the right amount of water to flour, which is also a silly thing as all we’re making is a soft dough. If it’s too dry, add more water and vice versa! But, start by putting the flour in a large enough bowl to mix, and pour some salt on top and mix it around a little bit. You pour the boiling water right into the flour mixture. Grandma use to just use her hands and mix. I do not recommend it as you will probably burn yourself. I think you should use a mixing spoon or something like it! But, mix it until it forms into a nice ball of dough. When this happens, take it out an knead it for a little bit, just enough to keep the ball together. Now, I usually cut the dough into smaller pieces so it’s easier to work with. Keep the other dough not being used covered with a damp cloth. Roll out the dough so it’s flat and even. If you’re picky, run it through the pasta machine so it’s uniform in thickness. Now we got strips of dough and we’re good to go to cut out circles! You can either just fill them and seal the edges with just some water, which is the traditional way… but I wanted to use my perogy press this time, so it looks the same. It wasn’t a great idea as you can’t STUFF them, but it’s okay. There you go, you’ve made dumplings! If you’re freezing them, put them on a cookie tray so they don’t touch each other and freeze them individually first before you put them into a ziplock bag. This will prevent them from sticking together. Now, we pan fry them (or steam them, or how ever you want to enjoy them)! Okay, I make it sound like it’s the simplest thing in the world, it is once you get the hang of it! It’s okay, practice makes perfect and as long as it tastes good, who cares how it looks! My first batch was really ugly! I’ll actually show you! 🙂 Just put the prettiest one up front, and it’s alright! My brother-in-law came to visit, and as a welcome gift, I decided to make one of his favourites, which is Man Tou! The other thing he really likes is white rice, and that’s definitely harder to bring to the airport to greet with (in my opinion – without doing something fancy to it). So, I just made a small batch, and it’s quite simple! First, you mix the yeast with the warm water, and give it time to activate. You can also use instant yeast, especially if you’re pressed on time. I was pressed on time, but didn’t have instant yeast – so my end results was a little more dense. After the yeast had doubled, mix the sugar with the flour, then pour the yeast mixture and oil into the flour mixture as well. If you have an electric mixture, use the hook attachment and knead for about 10 minutes. If you’re like me, then just knead until the dough is soft, smooth and quite “silky”. Now, you can roll out your dough into a rectangle, and roll up one end. Then, with a pastry cutter, cut the log into pieces and place on little squares of parchment paper. Now, you can set up your steamer while the dough rises for about 20 minutes. When you’re ready to steam, steam it for about 13 to 15 minutes if you’re making the large man tous, and 10-12 minutes for the little ones! Serve while hot!